We are delighted to have reached our fifth birthday, having generated strong relative returns for our investors. As expected, this has been driven mostly by superior stock selection, though country allocation and active currency management also have played positive parts in this success. We are especially pleased to have outperformed in both strong and weak markets – an ability that remains useful for navigating today’s volatile conditions. As we pass our five year anniversary it’s an appropriate time to take stock of how the asset class has performed, how we have performed, and how we see the future. It’s also a fitting time to remind readers of our consistent approach to making and protecting money in this complex world. We also will take this opportunity to propose a solution to a problem that increasingly confronts allocators, managers and investors alike, in emerging markets: excessive concentration of the largest markets in the MSCI EM benchmark. For those who have backed us over the last five years, we offer you our thanks. To those who curbed their enthusiasm in the hope of better entry levels, we hope to persuade you that now is a good time to revisit the asset class. But before we turn to the future, let us briefly review the past. Whilst we keep an eye on absolute returns, the strategy’s stated objective is to outperform the MSCI EM benchmark by at least 3% per year. We are delighted to say that we have exceeded this target, achieving 3.4% outperformance per year with a strong information ratio of 0.75. 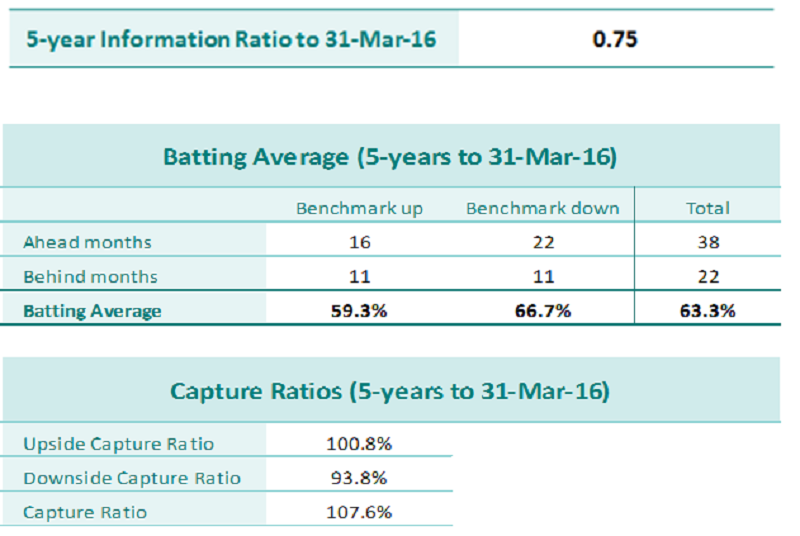 Importantly, we out-performed in both rising and falling markets, as shown below in the batting averages and capture ratios. We generated this outperformance primarily by rigorous bottom-up stock selection, but also by country allocation and active currency management – exactly as we expected. This effective integration of top-down with bottom-up, including our demonstrated skill at hedging currencies is one among several key differentiators of TT GEM. Source: TT International | MSCI | DataStream. The last five years clearly have not been a vintage period for the asset class, with the MSCI EM USD index falling by 17.6% in total return terms since the end of March 2011. In stark contrast, developed markets enjoyed a period of strong performance. 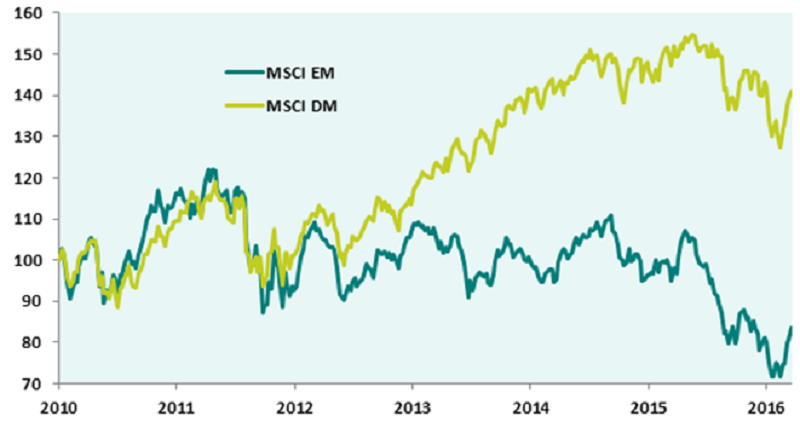 Consequently, DMs have outperformed EMs by 69% since the start of 2010. 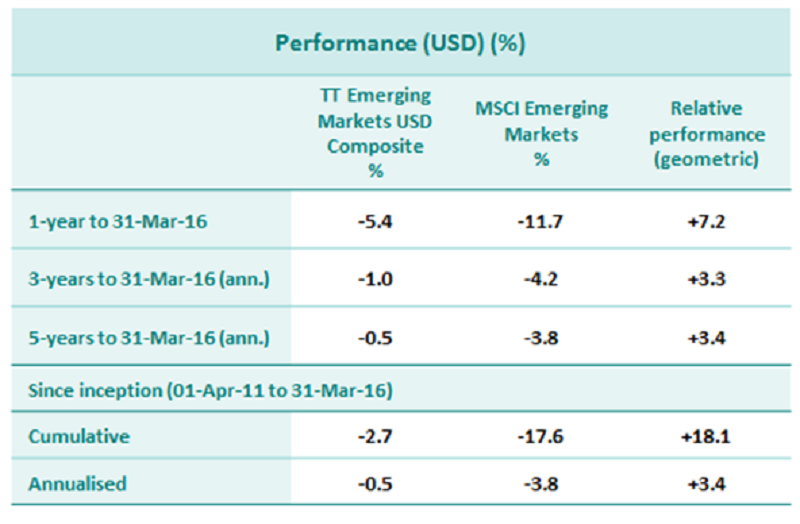 This is unsurprising given that EM underperformance is well correlated to USD strength and commodity price weakness. With the US dollar now off its highs, and oil and broader commodity prices having rallied substantially off their lows, it is no surprise that EMs have outperformed so far this year. The current dollar bull market began in 2008 and is already quite far advanced. Historically, dollar reversals have averaged 4-6 years in duration and 45% in magnitude. These technical guidelines suggest that we are approaching the end of the rally. Furthermore, policy divergence between the US Federal Reserve and the world’s other main central banks has reached extremes levels. Testimony from Federal Reserve Chair Yellen shows that the Fed is concerned that this policy divergence has led to dollar strength, which has subsequently damaged the US manufacturing sector. By making additional rate hikes conditional on an end to dollar strength, we believe that the Fed has limited further dollar appreciation. 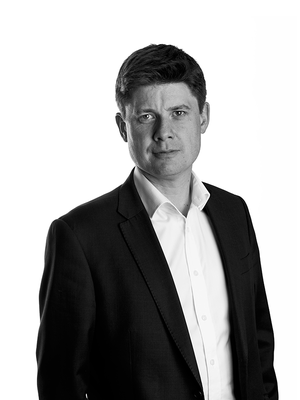 As for the recent move in commodities, whilst we remain concerned about the near-term supply/demand dynamics in most traded commodities, our recent meetings in China suggest that Chinese leaders are undertaking a concerted effort to remove excess supply across a range of industries in the world’s second-largest economy. If successful, this would improve pricing power in products like steel, aluminium and nickel. Industry cost curves prove poor guides for forecasting prices over the short term, particularly in times of financial market dislocation; but over the long term the laws of economics hold true. We expect a gradual but sustained recovery in commodity prices over the next couple of years as private corporations end loss-making production, and governments follow China’s lead in curtailing subsidised unprofitable commodity extraction and processing. Against this increasingly benign global backdrop, we expect the EM growth premium to re-emerge and for investors to rate this growth more highly. Furthermore, we firmly believe that EMs now offer tremendous value for strategic investors. The P/B discount of EM to DM is as wide as we have seen in over a decade (see charts). This is despite similar RoEs in EMs and DMs. We believe that the implication – a higher cost of equity in EM – is a function of the factors outlined above; because a strong USD and weak commodity prices tend to stress the balance sheets of EM sovereigns and corporates and introduce inflationary pressures. As this elevated cost of equity subsides we expect the relative valuations to narrow again. In short, EMs continue to offer the same long-term attractions that drew us to them at the start of our careers. Now, after half a decade of commodity and currency headwinds and the resulting underperformance; and with external conditions easing and valuations at extremely exciting levels, EMs are poised, we believe, for a cyclical rebound as well. We formulate our FX views as part of our asset allocation process. TT has been doing this in our international portfolios for over two decades, with excellent results*. A little over 10% of the relative performance of our EM strategy has derived from our active FX overlay, which we similarly limit to contributing no more than 10% of total tracking error. Often currencies are the starkest indicators of risk appetite in EMs, partly because low domestic savings rates leave EM FX vulnerable to the whims of foreign capital flows. Yet many EM companies – like exporters – benefit in local terms from a weak currency. This tends to exacerbate volatility and provides fantastic opportunities for investors with a disciplined process. An analysis of hedged versus unhedged EM returns on a monthly basis from December 2002 clearly shows that currencies tend to amplify returns. During periods of low or negative returns from EM equities, the currencies in aggre-gate were also weak. Conversely, in strong markets, EM currencies were also strong. For us the conclusion is clear. In difficult markets, active currency management, if successful – as we have been – can allows us to own stocks that perform in local terms, yet hedge away exposure to weak currencies. Equally, in strong markets, we can gain exposure to currencies by buying stocks, but can also go further overweight, if we have strong conviction, by buying such currencies directly. Our track record has shown that it is possible to generate a sustained source of alpha from going both long and short EM currencies, within our macro framework and risk budget. * over 241 three-year rolling months to 31/12/2015, currency management in TT’s EAFE strategy has added value 82% of the time. In the five years since we launched the strategy, one of the most important shifts has been both the slowing, and the changing composition, of Chinese economic growth. The fact that growth is slowing largely just reflects the law of large numbers: in 2007 China was a $3.5 trillion economy; now it is approximately triple that size at over $10 trillion. So while growth has slowed, as almost inevitably happens from such formerly stratospheric levels, China’s contribution to world growth in USD terms is substantially larger now than in 2007. At the same time, we’ve seen a shift from heavy emphasis on infrastructure capex to promotion of consumption. On a January trip to China with our Founding Partner and Chief Investment Officer Tim Tacchi, we visited a long established contact at the PBOC. There were two clear messages: 1) the authorities are mindful of the need for supply-side reform; and 2) they are aware that their communication with investors about market intervention and exchange rate policy requires improvement. Supply-side reform implies that excess capacity by inefficient players in many manufacturing sectors will be choked off by tightening credit. This is a positive solution and should be welcomed, although there is a fine balance between effecting an orderly transition and possibly instigating an unhelpful rise in bad debts and corporate credit spreads. Whilst we are optimistic that such a transition can be managed in an orderly manner, we remain circumspect on the investment opportunity in Chinese banks. A substantial rise in bad debts is probably already in the price, but potentially alarming headlines may cause further short term weakness due to poor sentiment. Regarding the RMB, the Chinese authorities have outlined a plan to manage the currency in line with a trade-weighted basket, rather than against USD. Although we expect the currency to drift modestly lower, we do not share the bear view that a sharp one-off devaluation is inevitable. More broadly, one of the most attractive features of the EM asset class is its extreme diversity, which creates numerous opportunities for active managers. Whilst many EMs like South Africa and Brazil are struggling to deal with weaker commodity prices, others such as India and Indonesia are substantial beneficiaries. Similarly, whilst some countries including China have demographic problems, others such as the Philippines have a young, consumer-focused workforce. Our team visited all these countries recently and found that many of the opportunities they uncovered five years remain today. For example, we continue to see a sharp switch here, as in many other EMs, from consumption of goods to consumption of services like healthcare and education. Over time the EM indices have become dominated by Asia. As at the end of March, the MSCI EM index is 69.8% weighted towards Asia and, at the country level, 23.9% towards China. As MSCI gradually ease their criteria for entry, these numbers will likely continue to rise. This creates a dilemma for the EM investor. The uncomfort-able truth is that the index is becoming more and more skewed towards what in many ways are the least “emerging” of the EMs and the least attractive investment opportunities within them. The larger markets in the index, like China, Taiwan, Korea, Brazil, Russia, and South Africa, represent countries that are either more developed or have penetration rates in the financial and consumer services industries that leave little room for secular growth. Many of these countries also face challenges in dealing with deteriorating demographic profiles akin to those in the Western World. Our asset allocation process aims to avoid the worst implications of the trends outlined above. However, as China becomes increasingly dominant, we expect that many investors will consider allocating to China specialists (and possibly to a lesser extent to specialists in the other dominant EMs), alongside mainstream global EM managers. With this in mind, in 2015 we launched a sister EM strategy that is unconstrained, highly concentrated, and tilted towards the smaller EM markets that are truly emerging in nature. Investors should expect a high degree of stock overlap between the two strategies, but they are likely to be significantly different from a country selection perspective, with the unconstrained strategy having far greater exposure to smaller, less developed markets. We expect the combined capacity of the strategies to be unchanged at $3bn. Why TT for Emerging Markets? Our approach combines top-down analysis with thorough fundamental research. Though our top-down framework does not categorically dictate what or where we buy, in a world of conflicting economic drivers it acts as a crucial guide for directing research to the most attractive opportunity sets. It also provides the core analysis for our active currency management – a key differentiating feature of the strategy. As a result of our team’s detailed fundamental analysis, stock selection has generated approximately 2/3 of our alpha. Thus it’s critical that we exploit the most rampant inefficiencies. As we move down the market cap spectrum we find that sell-side coverage of EM stocks falls off sharply. This is where we can add substantial value through proprietary financial modelling and regular meetings with senior company managements. Both enable us to develop a deep understanding of a business and identify catalysts that should crystalise value for investors. We end up with a portfolio of 50-60 holdings, containing only our highest conviction ideas and boasting a high active share, currently in excess of 85%. The currency hedging overlay further enhances returns and, crucially, promotes purer stock analysis in local terms. Our ability to protect investors from currency volatility has been invaluable and has enabled us to invest in attractive stocks without having to fight against currency devaluation. Over the past 5 years, we have proven that our process can outperform in both up and down markets. The outlook for EMs remains uncertain, but we take comfort from the fact that these markets have underperformed for many years, are generally under-owned by international investors, and are cheap on most historical metrics. We believe that asset allocators who start to build EM exposure now will be handsomely rewarded on a multi-year view. Yet in a world of lower global growth, a rising tide will not lift all boats. Whilst we are confident that now is a good entry point into EMs for investors with a long term view, there will continue to be very diverse returns within the asset class, driven both by disparities in country- and sector-level per-formance; and winners and losers at the stock level. Thus success in EMs will require both skilful stock-picking and astute top-down thinking. Although we have always believed in the importance of country allocation, we could not have anticipated the increasing relevance of this part of our investment process. The coincidental ends of commodity and credit booms across swathes of the emerging world in 2008-9 contributed substantially to the political and social challenges that many of our markets face today. Discomforting as it may be to witness, we have seen deteriorating standards of political and economic governance in parts of the EM universe. Some countries have seen rising populism, others have had governments actively seeking to hollow out or co-opt civil society, judiciaries and public institutions. Emerging markets are more politically complex and fluid than at any point since the global financial crisis. There are markets out there that excite us – India, Indonesia, the Philippines, Pakistan, and Argentina, to name a few. However, nothing is static in the EM space. We believe that the best chance of success in this complex arena comes from insightful top-down analysis to identify opportunities and threats; combined with robust, detailed stock analysis. We look forward to addressing these challenges and capitalising on the opportunities that lie ahead over the next 5 years.